Welcome to the exciting new comp brought to you by the UK Online Scrabble League (OSL) but OPEN & FREE TO ALL players that have access to the Scrabble Worldwide app. Match wits with fellow Scrabblers from across the globe in a FREE, fierce but friendly contest! Round robin groups of 5 (=4 games), top 2 players from each group advance to the next round. Once we are down to 16 qualifiers we'll be joined by 16 seeded players from the OSL family (UK, Adelaide & Sydney). This 32-player KO will be best-of-5 in each round. All games will be played using the Scrabble Worldwide Facebook app, with the timer = 1 week. You will need to FRIEND your opponents to create games against them. We provide instructions on how to modify your privacy settings if required. All players are asked to adhere to the UKOSL Fair Policy (i.e. dictionaries are OK, anagramming/game-analysis software IS NOT). There are no prizes, so what is the point of cheating anyway ?? This is an OSL rated-tournament, so if you are new to our comps, you will receive an initial rating which will help us put you in a suitable UKOSL div should you choose to continue in the UKOSL. The max load at any time is 5 games, so it is designed to run in parallel with the regular OSL rounds. You do not need to be at your computer at the given start time, you will be given 1 week's grace to get your initial games underway. 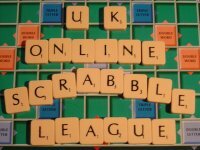 UK Online Scrabble League is a Facebook group dedicated to providing fun and challenging Scrabble comps to players of all skill levels. If you live in the UK/Ireland it is FREE to enter all comps. Others are welcome to join after paying an admin fee of 10GBP/6-months.